Williston Northampton and Local History . . . Your History! In 1854 Samuel Williston established the Hampshire and Hampden Railroad Company. He and his longtime business partner, Joel Hayden of Williamsburg, Mass., initially hoped to extend the line as far as Troy, New York, but their realistic concern was to connect Easthampton and Williamsburg, both former villages that were now evolving into factory towns, with what they correctly saw as a rapidly developing national rail grid. The H. & H.R.R. purchased the route of the defunct Northampton-New Haven Canal, an ill-conceived enterprise that had already lost Samuel a considerable sum. The project took five years; competing railroads did their best to create obstacles. Samuel ultimately spent $35,000 of his own money—about $820,000 in current dollars—to see the 24-mile rail spur’s completion. 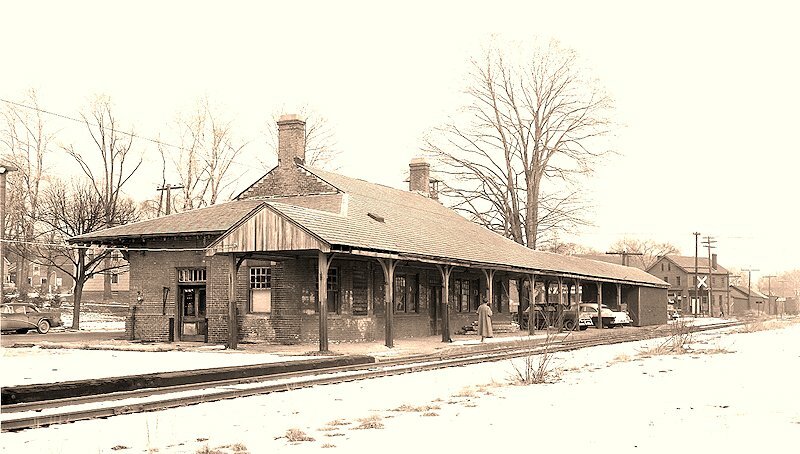 The Easthampton Rail Station in the mid-1950s, shortly before passenger service ceased. Whether there was an elaborate rail station in the early years, or just a simple shed, has not been determined. The present building apparently dates from 1871. In its original state it contained a large waiting room, baggage room, and office for the station master. Subscribe to From the Archives and Never Miss a Post! The Archives of the Archives Blog!